A weekly newspaper editor has begun his retirement after 49 years in the industry. Keith Whitford, left, left his role at the helm of the Cornish and Devon Post yesterday after spending 20 years at the title, which he originally joined as news editor, becoming editor seven years ago. He started out in journalism at the Tavistock Gazette then went on to work for the Western Morning News, the Western Times and the Express and Echo in Exeter, then went freelance until joining the Post. 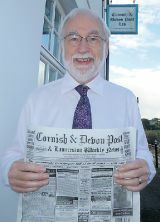 Taking over as editor of the Cornish and Devon Post is Colin Brent, currently editor of sister Tindle Newspaper title the Tavistock Times, where he has been for 23 years. The Post which is based in Launceston, is thought to be one of the last in the country to fill its front page with adverts, with just a small editorial space. Keith’s career in newspapers began 49 years ago when typewriters and hot metal were still in use and he has witnessed many changes in the industry, including the advent of digital technology. In an article about his retirement, Keith said he had “enjoyed every moment of it”. He wrote: “My career in newspapers started 49 years’ ago and has gone from an ancient Imperial typewriter and hot metal to the ‘white heat’ (virtual, of course!) of modern technology. “I have enjoyed every moment of it and feel it was like being given a passport to travel along with readers’ lives and reflect and report on their highs and lows. “It is not really a job when you are lucky enough to do something you love. It has been a privilege and a pleasure and I thank sincerely readers, advertisers, and sellers of the Cornish & Devon Post for their loyalty to their local paper. “I would also like to thank the staff past and present for their support since I joined the Cornish & Devon Post as news editor 20 years’ ago. “Most of all I would like to pay tribute to my wife, Anthea, for her backing and understanding in what can often be a stressful occupation.